Kok pronounced like “coq” or the smaller, mini ones which are called kokakia (pr. coqakia) are small sponge cookies which after being wet with syrup, are filled with a vanilla pastry cream and then the top sponge is covered with a chocolate ganache. I don’t know why they are called Kok but my guess is that they take were named from the carbon Pet Coke, which in Greek is also called Kok, something which makes sense because of the chocolate colour on top. Today is Evangelismos tis Theotokou (Annunciation Day) and also our Independence Day. Chronia Polla to all our co-Hellences and Chronia Polla to my daughter, Evangelia (Elia) who is celebrating her name day. Whenever someone is celebrating their name day, there is always a dessert to offer to our guests. Although today I have made eclairs as this is what she asked me to make, yesterday when I was preparing the choux pastry, I posted an older picture on Facebook and Pinterest and Eftychia, a friend from Dream of Cakes, left a comment asking me if I had made “Kok” before. When I replied to her by e-mail, I saw that as I had all the recipes posted, so it would be easy for me to make a post about this Greek dessert. This Greek dessert is very popular and you can get them in all confectioneries (zacharoplasteio) or bakeries (fournos) even in the remotest town in Greece. Before learning how to make sponge cake we used to buy mini “kok” from our neighbourhood’s confectionary, together with eclairs or other mini choux filled with cream and covered with caramel on top, so we always ended up eating 3 each. In order to make this dessert, you will need to make some sponge cake, some pastry cream, some whipped cream (chantilly), a simple sugar syrup and some chocolate ganache. This may sound as a lot to do but if you have made sponge before, it is very easy to make. You can prepare the sponge from the previous day and assemble the dessert the next day. Makes: around 10 large ones. Basic sponge recipe. Prepare the sponge batter. Line your baking tin with parchment paper. Put it in a piping bag and pipe out rounds with a diameter 6 – 8 cm (2 1/2 – 3 inches), spaced apart as they will expand. Bake them in a preheated oven to 180 degrees C / 350 F, for 12 – 15 minutes, depending on your oven, until golden. Note: If you prepare the sponge from the previous day, storage will depend on weather conditions. If it is very hot and dry you will have to store them in air tight containers, each layer between parchment paper, not in the refrigerator. If the weather is normal you can just cover them with cling film and a clean kitchen towel on top. Basic pastry cream. You may need less than the dose mentioned. I made half the dose mentioned in my recipe, which was not enough. I think it is better to make the whole dose and if you have leftover, it still can be served in a bowl. Vanilla is usually added to this cream but the flavour is up to you. If you like, you can make a chocolate cream as a filling. When the cream is ready, cover it with cling film and set aside until it cools. Syrup. Prepare a very small amount of syrup in a very small pot. I would say not more than 50 – 60 grams of sugar/same amount of water. If you prepare more, you can store it in a jar in your refrigerator for other use. If you make spoon sweets, you can use leftover syrup which is even better as it is already flavoured with the aroma of the fruit. Using a brush, wet the sponges. Don’t make them soggy. Whipped Cream. Follow my basic recipe. When the pastry cream cools use a hand mixer and whisk it. Add the whipped cream and whisk to combine both. Put the cream in a piping bag and pipe out the cream. Chocolate Ganache. Prepare the ganache with the type of chocolate you prefer and set aside for a while to start setting. Then using a spoon to cover the top. Sprinkles are optional. Kok pronounced like "coq" or the smaller, mini ones which are called kokakia (pr. coqakia) are small sponge cookies which after being wet with syrup, are filled with a vanilla pastry cream and then the top sponge is covered with a chocolate ganache. Basic sponge recipe . Prepare the sponge batter. Line your baking tin with parchment paper. Put it in a piping bag and pipe out rounds with a diameter 6 - 8 cm (2 1/2 - 3 inches), spaced apart as they will expand. Bake them in a preheated oven to 180 degrees C / 350 F, for 12 - 15 minutes, depending on your oven, until golden. of water. If you prepare more, you can store it in a jar in your refrigerator for other use. If you make spoon sweets, you can use leftover syrup which is even better as it is already flavoured with the aroma of the fruit. Using a brush, wet the sponges. Don't make them soggy. Those look delicious! What a divine dessert. Un dessert délicieux. J’aime beaucoup. Je t’en prendrai un pour déguster. I’ve never heard of Kok and certainly haven’t had one, but sure would love to them the a go. These look very, very yummy! I love the sponge cookies but then the pasty cream and chocolate topping – OH MY! To heck with the meal – bring on the KoK! I think these Kok are so much better than eclairs. They look so luscious. I will definitely tell my wife to get the steps here. Similar desserts are quite common around Italy as well, but I don’t think they have a specific name – it is left to the fantasy of the chef patissier! Your version looks delicious. I’m salivating!!! They look gorgeous and delicious :D, the older I get the more I get to like sweets. Felicidades to Elia. They look like little whoopie pies. I think I’d prefer them to eclairs. I’ve only had these a few times in Greece, but damn, now I need a special occasion to make them myself. Yours look fantastic! Are you sure you don’t own a zaxaroplasteiou? These are scrumptious and terrific to celebrate the two occasions with! These sponge sandwiches are so delectable looking Ivy! Hope you had a great holiday! I always said the great traditional food of the Greeks is one of the best ever. All looks delicious.Wanna try these dessert. Ivy, I’m so glad you made these so now I have a recipe to follow! I’ve been wanting to make kok for so long, and it was on my 30×30 list but I never got around to it. They look delicious. 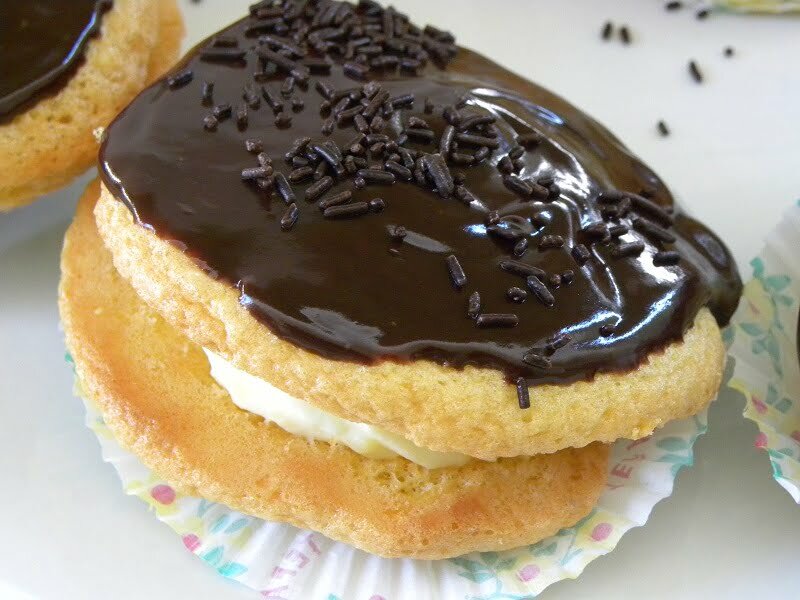 These look delicious and look just like mini Boston Cream Pies that are popular in the northeast U.S.